Buying a weighted blanket isn’t rocket science. Yet, it’s important that you learn all the details before spending your money. There are many things to consider: Are you choosing the comforter for your child or yourself? What’s the size or fabric type you need? How heavy should it be? Here are your go-to guidelines for buying a weighted blanket, and avoid regrets. How heavy should your weighted blanket be? 1 How heavy should your weighted blanket be? 1.1 Is the 10% of body weight recommendation really adequate and comfortable? 1.1.1 Can I use my husband’s weighted blanket, even if it could be a bit too heavy for me? 1.2 What is the average blanket weight range? 1.2.1 Can I use more than one weighted blanket at once? 2 Which Size Should I Choose? 2.2 Then How Big Should Your Weighted Blanket Be? 3 How to Choose the Right Fabric? 4 How Much Should I Pay for a Weighted Blanket? 4.0.1 Is this option unavailable to you? 5 How Do I Recognize the Quality of a Weighted Blanket? 5.1 Do I Need to Buy a Cover for My Weighted Blanket? 5.2 How to Buy a Weighted Blanket Cover? 5.2.1 How much are the covers? 5.3 How Do I Need to Take Care of My Weighted Blanket? There is a consensus about that, in order to be effective, a heavy blanket should be 10% of your natural body weight. You may add 1 or 2 extra pounds for additional weight if you like. This is what I did, for example, I knew I would enjoy having just a bit extra weight, I'm around 165 Lb, and bought a 17 Lb. blanket, as I thought it would be the safest bet, and so far I've got to say that I couldn't be happier with my choice. 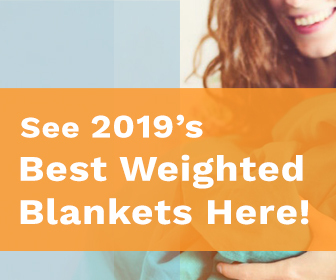 Before you go running off to buy the perfect ‘blanky’ though, there are a few things I'll discuss here, so you can know more before choosing your blanket's weight. Remember that a heavy blanket is made to provide therapeutic benefits and not to crush you, or make you uncomfortable. So, think about it that carefully when making the investment. Most manufacturers recommend sticking to 10% of your body weight, for safety reasons. And the average person finds a 10% weight acceptable and comfortable. Having said that, I've read about many unsatisfied buyers claiming that they would be way happier if they had gotten a heavier one. If you want to pick the safe choice, then use this 10% weight recommendation. But read on if you want to get into more details. If you're already sold on going around 10% you can go and see the actual weights offered by my recommended weighted blanket manufacturers. Is the 10% of body weight recommendation really adequate and comfortable? To achieve the so-called therapeutic effect of weighted blankets, without being too close to the limit where they can be just a bit too heavy, 10% is a great weight distribution. A lot of empirical research has gone into the topic, as well as trial and error (I'm just imagining these poor 120-Lb souls sleeping under 25 Lb blankets for "health's sake"), so I’d try and stick with them as a safe choice. However, we can agree that if you feel like you might enjoy the feeling of a heavier quilt, you may add an additional pound or two, only if you really think you'll be fine and comfortable feeling a little heavier, I've seen people try and feel great with that. Can I use my husband’s weighted blanket, even if it could be a bit too heavy for me? Depending on your level of comfort, and how much more your husband weighs than you do, you could do that. If your husband is 60 Pounds heavier than you, I’d be careful though, as that gives you both a range of around 6 pounds to pick a middle ground between you two, and it's a very wide range. So you might end up feeling like the blanket is too heavy while your husband feels like it's just a regular quilt! (probably not, but it's going to feel a bit underwhelming to him). I'd recommend experimenting first, to ensure that you don’t overdo it. You can read more about ways to experience weight before buying a weighted blanket in this article. Although, a heavier blanket shared between two people may give you exactly the desired effect you’re looking for. My girlfriend weights around 120 lbs, and she also loves my 17 Lb blanket, but she feels it can be a bit overwhelming sometimes, especially if it folds on top of itself while she's sleeping under it, which has happened, so if your thinking about going 3-5 lbs above your recommended weight, keep that in mind. What is the average blanket weight range? As I’ve mentioned, blanket's weights vary based on size and from manufacturer to manufacturer, and you have to choose according to your personal requirements. If you weigh between 20 and 40 pounds your blanket should be 3-6 pounds. Can I use more than one weighted blanket at once? At the end of the day, it all comes down to individual choice and preference. And about using two blankets I must say: I hope you're doing this because the blankets belong to your children and they're both really light!! But ok, sure, if you think you might be comfortable using two blankets instead of only one, then go for it, especially during winter or especially concerning health issues where you (or the person you are trying to help) might feel unstable and could use additional deep touch stimulation, for example during periods of trauma. It would be irresponsible to say that there aren’t any risks when applying a heavy item on top of a human being, especially when the person has a weakening health condition. A weight restriction of at least 20 pounds individual body weight, is often the minimum requirement to use a weighted blanket. Make sure to try the blanket stacking for a while before falling asleep. Wait about 15 minutes and check that your strength, maneuverability, and motor skills aren’t going to be compromised. No one would suggest using this for a small infant. You must be extremely careful if the baby is under 2 years of age, and you should never leave him alone to sleep underneath it. Extra care is to be taken when using a heavy blanket for a minor child though, you’d want to make sure they possess the physical strength to remove the blanket if necessary. Do not wrap or secure your child or baby in any way, merely place it over top for comfort and easy access, so he doesn't get trapped by it. If you suffer from conditions like Claustrophobia or Cleithrophobia, using anything that encloses you or places pressure on your body is not a good idea. You could end up having severe panic attacks. Therefore, these individuals should aim for lighter blankets. Having said all of that: if the body weight of the user is adequate, and the item is used responsibly, weighted blankets are very safe. And you shouldn't be worried. Minky and cotton, includes cover. One of the biggest mistakes buyers make when choosing weighted blankets is choosing the wrong size. You don’t need a queen or full-size blanket to cover your entire bed. Unlike a regular blanket, a weighted comforter should cover your body from chin to feet, that's it. The reason you need a weighted comforter – do you need it to improve your sleep or ease the symptoms of your disease/disorder? Your sleeping preference. Are you going to share your quilt with someone else? What’s their weight and height? Would they like the size of your quilt? The mobility. Are you going to use the blanket outside your bedroom? Car trips? Therapeutic sessions? It depends greatly on your body mass, your personal taste, the weighted blanket's purpose, and your particular needs. Sizes will also vary by a few inches here and there from manufacturer to manufacturer, however most of the time these companies have standardized sizing charts as well as customer support available to discuss your requirements, and explain what will work best and why. Luckily, there are loads of options when it comes to weighted blanket sizes and knowing how to choose the right proportions for you is very important. Most manufacturers offer a wide range of sizes; the widths can often be between 30" to 38" for kids and 36" to 42" for adults, if you want it to just lay over your body, 40" would be roughly about the same width as a twin mattress, but it won't reach the edges while you are using it, because you'll rise it a little bit. If you have a bigger bed, and want a bigger weighted blanket to be able to easily cover your body, while also maybe be able to share it with someone else, some manufacturers offer widths up to 64". Needless to say, these sizes are harder to carry around, so you wouldn't enjoy bringing this to a field trip. Those are the standard ranges for the shorter side of the comforter, and it'll get fairly expensive if you want a wider one, and not all manufacturers offer such high sizes. Now lets go with the long side, for kids, the ranges are around 42" to 60" inches these are for anyone under 5 feet tall, and for adults the most common weighted blankets are between 50" and 80" on the extra large side, this would be as long as a king or queen mattress, and you guessed it, it's really expensive. Then How Big Should Your Weighted Blanket Be? 5' to 5' 4" --- 50" to 56"
5' 4" to 5' 8" --- 54" to 60"
5' 8" to 6' 2" --- 58" to 66"
6' 2" and above --- 64" or more. For kids, you shouldn't be that picky as they grow faster, and there are fewer options to chose from on shorter sizes, but most manufacturers will suggest that if your kid is still under 6 years old, you should stay under 44" for the blanket's length. If over 6 years old, he should be fine with a blanket between 44" and 50", but you can get a bigger one if you want it to be the size of her bed. About the right width of the blanket for your kid, he should do fine with a 36" to 38" wide, but you could go a little under this if he's smaller, say all the way down to 24" for a toddler. If you want to pick up the comforter based on the size of your bet, then measure on top and across your mattress but not over the edges. Remember that the purpose of weighted blankets is purely therapeutic, and must be laying on top of you, so every portion of the comforter hanging over the sides of your bed is wasted weight. Obviously, your heavy blanket will be way thicker or lay higher on the bed than a regular quilt would, due to the fact it’s ‘stuffed’ with fillers that grant it volume. Although it shouldn’t be too obtrusive if the weight distribution has been done correctly. The height or bulk of your heavy blanket may be around ½ inch to 1-inch thick give or take. I couldn’t find any compelling evidence during my research that would support a person’s height having any major impact on what the weight of the heavy blanket must be, other than making sure the weighted comforter covers the whole body if you wish it to. For example, if you are over 6 feet tall, you wouldn’t want a blanket that’s only 52 inches long because that would leave at least 25% of your body exposed and it would feel really short for you. Now, if you’re like me and you don’t mind that, then it wouldn’t be a big deal if your feet were exposed or not. Some people feel great and feel that they gain a little mobility when having a portion of their legs sticking out of the blanket. So, as I’ve said in the point above, the other consideration would be the thickness of the blanket, in terms of the pocket mass where the pellets would be sewn into. This would obviously differ depending on the weight distribution. For example, a small 10-pound blanket made in a 38 inch by 50-inch scope will be significantly thinner than a 20-pound blanket with the same dimensions as the weight is distributed over a more vast space. Make sense? Now I'm basing my calculations on buying a proper whole heavy blanket, one that you can lay onte the bed and cover its upper surface, so the size of the comforter would be similar to the size of your kid's bed. The “law of averages” still states that a heavy blanket should be 10% of a child’s body weight plus 1 or 2 extra pounds. Therefore a 30-pound child would have a blanket mass of 5 pounds. The average child’s bed is usually a twin or single sized mattress, after they leave the crib, as in most cases this bed size is too short for an adult. This mattress’s dimensions are approximately 38 inches wide by 75 inches long. A twin XL mattress is usually the same width as a regular twin (around 38 inches) but has an additional 5 inches on the length (80 inches). This is more or less the same as a king or queen mattress. If your child sleeps in a double bed or full-size mattress the dimensions would be 53 inches wide, (a mere 15 inches wider than a twin size) and 75 inches long, therefore your blanket size should be approximately 50 inches wide by 71 inches in length. That’s simply 4 inches off each the width and the length. However, you really can customize the right size for your child. The unwritten rule when sizing a large, or really any weighted quilt is correct weight distribution, I touched on this earlier. In order to maintain the therapeutic benefits, the full pressure must remain over the body of the user and not spread over the entire bed. Think of it this way, if the bulk of your blanket is drooping over the sides of your bed, there won’t be enough mass on top of you and you may as well be using any regular old blanket, duvet or quilt. If you place a weighted blanket of 20 pounds with these queen-size measurements over your entire bed and hanging over the edges, gravity will naturally pull at least 30% of the overall mass of the blanket down to the ends, taking the necessary force off your body. This will result in reduced pressure effects from your weighted blanket, and it could even be quite uncomfortable too. Now, a king-size mattress measures at 76 inches in width by around 80 inches in length (that’s around 16 inches wider than a queen). Divide that between a couple sharing and your individual space becomes significantly less. This is also the case when sharing a weighted blanket, so you may want to add a couple of pounds to your order if you’re planning to double up. And then there was the California King!1 Imagine trying to make a heavy blanket to fit that. Even though it is possible, I wouldn't advise getting one, as again, the weight distribution would be displaced, and insufficient pressure would be placed on the user. Having said all this, there really is no weight restriction when it comes to adults, provided the adult is strong enough to handle removing the blanket easily if he needs to. The heaviest weighted blanket I’ve seen available for purchase, was actually 25-pounds as a standard order, and 30 pounds as a custom order. Now, you can really go as heavy as you like, but do keep it within reason for safety’s sake. And that is it on the sizing subject. You should now be an expert. How to Choose the Right Fabric? Weighted blankets are made from a variety of fabrics. Choosing the right one is tricky, and again, it depends on your sensory preferences. For instance, if you’re always cold, even during the summer season, you should probably opt for a flannel quilt. This fabric is great for keeping heat and is ideal for the cold months. If you’re prone to hot flashes or you tend to get too hot, you could choose a quilt fabric. It’s much cooler than flannel, but can be rough to the touch. This blanket is recommended for summer and menopausal women. Apart from your preference, it’s crucial to consider your budget, as some types of fabric are a lot pricier than others. Moreover, if you have texture sensitivities, you should also keep that in mind to choose the fabric that is best suitable for you, as many blankets are built with the intention of providing plenty of sensory stimulation. Check out all of the weighted blanket fabric types to help you decide which one you need. Apart from the fabric type, pay attention to the filler of the blanket. There are inorganic and organic fillers. Organic fillers tend to effectively absorb and conduct the heat while inorganic ones don’t conduct the heat and thus are much cooler. Learn more information about the weighted blanket fillers and how each of them affects the temperature under the quilt. How Much Should I Pay for a Weighted Blanket? A weighted blanket is a money-consuming investment, so for many people, the price is as important as the fabric type. Even with the cheapest fabric and filler, a weighted comforter can drain your budget. But why? There are plenty of factors that affect the price besides the fabric and filler. First of all, who are you shopping for? If you’re buying the blanket for your child, you’ll most likely pay less than if you're buying it for yourself. The try-it-before-you-buy-it rule is a money saver here. If you know someone who already has a weighted blanket, ask them if they can lend it to you, just for a night. If you’re buying from a local store, ask for a short trial session before a purchase. Is this option unavailable to you? Try out these little tricks about cheap weighted blanket trials. In case you buy the blanket in a rush and it doesn’t meet your needs, remember about the money-back guarantee that you can request within 14-30 days of purchase from most manufacturers. If you’re really tight on cash, dig deeper and check your medical insurance coverage. Weighted blankets are considered as medical expenses and some of them are tax deductible. This means, your insurance plan may cover your expenses if you have a prescription from your doctor. Smart shopping keeps your finances safe and sound. However, don’t forget about the quality. By choosing the high-quality blanket, you’re making a crucial investment in your health. Even if the blanket is going to break the bank, it’ll pay a huge return in health. How Do I Recognize the Quality of a Weighted Blanket? Speaking of quality, not everything that costs a lot is of the best quality. So, how can you recognize quality? Easy! Knowledge is power; the more you learn about weighted blankets, the better quality quilt you’ll select. First off, pay attention to the fabric and filler. These are the two most important factors affecting the price. Learning about a manufacturer though is even more important. Choose a reliable manufacturer and read the feedback about it. The most critical thing to remember is that some of the cheapest comforters you'll find out there are of the worst quality, and you'll probably regret buying them without having done a proper research. Do I Need to Buy a Cover for My Weighted Blanket? If you choose a high-quality weighted blanket that meets all your needs, including your texture preference and you don’t use it daily, then there might be no need of getting a cover. If you already purchased the blanket and you don’t like the texture, a cover can change it. Some people buy the covers for the low-quality comforters to improve the quality and prevent mishaps. While this trick can be worth the candle, you might end up spending more than you’d spend on a top-quality weighted blanket. Depending on the weight, heavy blankets could be not that easy to clean. But the cover can help you keep your blanket clean, and it’s super easy to wash in the machine at home. If you have a waterproof comforter, investing in a cover will make it easier to clean. Plus, it will reduce the likelihood of itchiness that waterproof fabrics tend to trigger. How to Buy a Weighted Blanket Cover? Just like you choose the blanket, you choose the cover. Decide on the fabric you want and ensure it’s soft to touch and doesn’t influence the temperature under the quilt. Also, think about the weighted blanket sets that include the inner layers and outer covers. Do you want a set or just a cover itself? You can use the inner layer without a cover during the warm months and add a warm and removable cover to the inner layer during the cold months. Today, it’s not easy to find the covers and inner layers sold separately. But if you don’t need an extra weight, then there’s no need in buying a set with an inner layer. How much are the covers? The price is based on the material the cover is made from and it can vary from manufacturer to manufacturer. The average price of the cover can go from $24 to $60, sometimes even more. How Do I Need to Take Care of My Weighted Blanket? Again, a lot depends on the fabric type and weight you choose. If your heavy blanket is less than 5-10 pounds, you can simply clean it in your washing machine. Some fabrics may require handwashing. Read the special care instructions carefully, if your comforter features them. If you use your comforter on a daily basis, consider airing it regularly and clean it at least 2 to 4 times a year. Don’t wash your quilt too often though, as it can negatively influence the filler and speed up the fading process. For more detailed tips on how to take care of weighted blankets, check out this handy guide. Now that you’ve learned some basic yet highly important information about weighted blankets, you can make your final choice and click that buy button without a second thought. My partner and I are very interested in buying a blanket. He is 6’ 150lbs with Insomnia and hyperhidrosis, I am 5’2” 120lbs with PTSD, anxiety. We think we could really benefit from a weight blanket. We have a King bed. What would you recommend? Our current queen sized comforter is too small and hot. Your weight difference is similar to the one I have with my gf, so I would advice the same thing I did, as it worked for me, get it close to 10% of your partner’s weight, and don’t go over 14% of yours, or it’ll be too heavy for you. I’d say you would fine using a 15-16 Lb blanket. As for the size/fabric that’d be a matter of personal preference, but if you’re both going to use it at the same time then it’s gonna to have to be a BIG one. Ours is 42″x72″ and we fight over who’s going to use it! From all of reading on the Internet, you each should have your own blanket. Your weights and sizes are much different and you’d be better off buying ones to match your weights and heights. SO, BUY TWO! Your comment about the heavier ones being bigger is generally true, which doesn’t make any sense to me. Only the part of the blanket which touches you matters. The rest of that weight is wasted. If you’re only 120 lbs, it sounds like a 12 lb. weight would be best and one in a smaller size, as you are on the shorter side. From all the companies mentioned in this article, it seems as if Sensory Goods is the only one offering two or three sizes in each weight category. You shouldn’t have much trouble finding one for yourself. Sensory Goods makes there products in AZ, not China or elsewhere. AND theit prices are much more reasonable. They also have close to zero complaints of leaking glass beads. Most all the others complain of leaks! What a waste and a bug mess! Your bf should get a 15 lb blanket, but in a larger size to accommodate his height. Yes, you could try to get a 13-14 lb blanket, but keep in mind, the weight will not be concentrated on either one of you, because those pounds will be dispersed over a much wider area! That’s why having your own would most likely suit each of you better. These aren’t bed linens, they are therapeutic products designed for individual needs, who differ from others. I would like to purchase a weighted blanket, but my husband would definitely not want it on his side of the bed, therefore I’m considering a smaller-sized blanket to use only on my side. In my research, 10% of body weight seems to be the recommended calculation, yet the smaller blankets are lighter. I weigh 130 lbs., and wonder if a 36’”x 48” weighing 5 lbs. would be adequate. I never knew that weighted blankets were a thing. You said that we should look for fabric that is great for keeping heat and is ideal for the cold months. I’ll be sure to keep this in mind when searching for a weighted blanket. Carolyn, the 10% body weight rule is a bit misleading because it doesn’t take into account the distribution of the blanket. An experiment I just did involved taking two comforters, weighting myself, then weighting while holding them, which resulted in about 15 lbs of comforters. I laid both of them on top of each other, got under them and found I wanted something heavier. So I folded them both in half, and jumped in again. Much better, actually a little too heavy. So I took measurements. They’re both about 84″ x 96″, and at 15 lbs, the distribution is 0.2678 pounds per square foot (84 x 96 inches to feet, which is 7ft x 8ft = 56 square feet. 15 pounds divided by 56 square feet is 0.2678 lbs/sqft). So I folded the blankets in half, doubling the weight distribution to 0.5356 lb/sqft. I found this to be a little heavy, so I folded back a layer taking the weight down to about 0.40 lb/sqft. It’s not perfect, because with the blankets folded, the weight is entirely on top of me rather than spread over me (I’m 6’2, 290lbs with shoulders about about 24 inches wide) but I think it gives me a rough estimate of what I’d like weight wise (0.4 – 0.5 lb/sqft). Here’s the table I came up with from some of the common sizes on Amazon. The blanket you’re curious about is 36×48, or 3 x 4 feet. 12 square feet. 5 pounds divided by 12 sqft is 0.4167 lbs/sqft. If you like the feel of decent weight on you when you sleep, I think that would be a good distribution, but the physical size of the blanket may leave you trying to fold yourself up under it and not able to stretch out. I’m estimating that having the blanket spread out, instead of all piled on me is going to diffuse some of the weight, so I’m going with the 60×80 20lb blanket. Should be here next week. We’ll see.